Shots rang out after the rapper’s concert late Friday night. 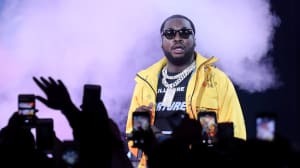 Two people are dead and two more received non-life-threatening injuries after a Meek Mill concert in Wallingford, Connecticut late Friday night, according to a report from My Record Journal, a local newspaper. The names and ages of the victims have not yet been released. Local police responded to a report of gunshots around 11:15 p.m. Friday night at the Oakdale theatre where Mill had just wrapped up a concert. According to police reports, people were already in their vehicles getting ready to exit the parking lot, and Mill just got into his vehicle when shots were fired outside the venue. Local police also believe the suspect was involved in a hit-and-run incident while fleeing the scene. A video of the incident taken by a bystander can be seen here, in which you can hear a gunshot and a voice saying, "look, there's Meek." As of 1 a.m. Saturday morning, investigators have no one in custody, and there is also no immediate description or the car of suspect available. This is a developing story and we will be updating this post as new information becomes available.